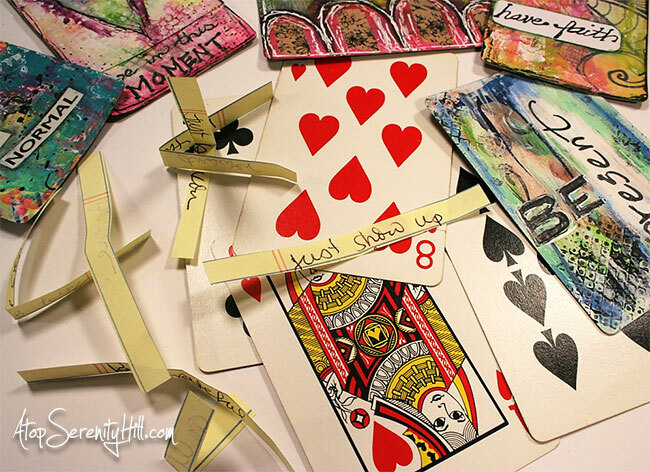 UPDATE: Learn to make your own Inspiration Cards with my online class! Click here for all the details! 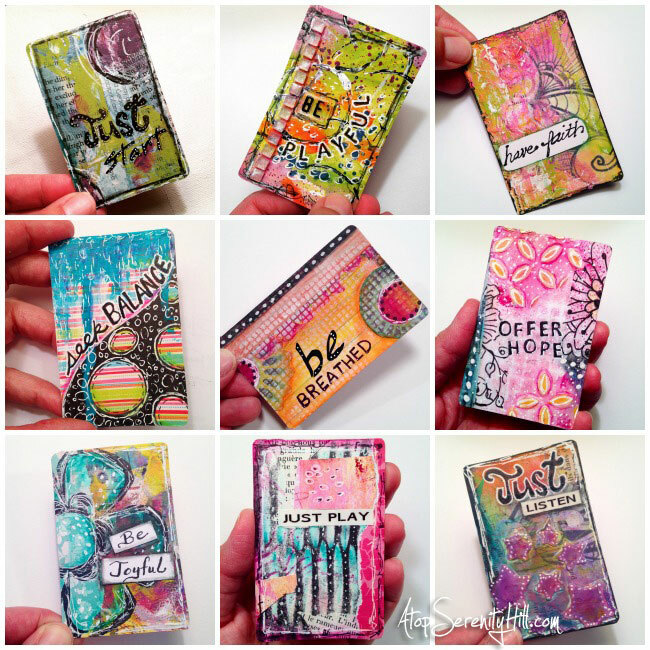 I have had a love of inspiration cards for many years. The first ones I ever saw where by SARK. They were so colorful and whimsical that I wanted to just sit and slowly go through each one. Soon after that experience, I was introduced to Cheryl Richardson and her Grace cards. Although the artwork on those cards is beautiful, it was the messages that drew me in. I own two decks by Cheryl and reach for them often for inspiration. At the beginning of this year as part of my year of creating, I decided to make my own deck to share on Instagram each week. It has been one of my most favorite projects to do. 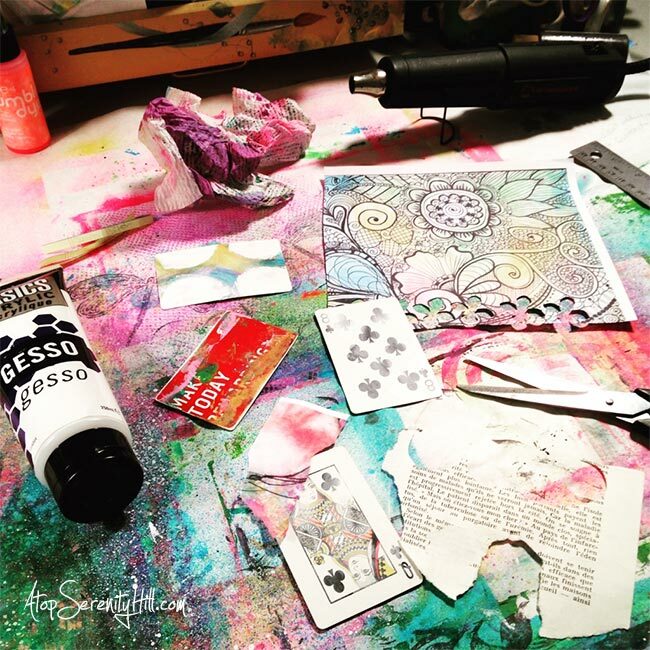 Creating the cards is all about playing with my art supplies and leftover bits on my studio table. Sometimes I start with gesso and paint…sometimes I glue paper down as a base. No thinking…just creating. I’m using a set of playing cards I received as a wedding favor from a couple close to my heart. I collected phrases (and continue to collect them), keeping them on bits of paper in a jar to pull out each week when I create the next card. I wanted the messages for the inspiration card deck to be spontaneous because most of the time I need to hear the message too! I post that week’s card on Instagram and Facebook each Friday (sometimes Saturday!) to give my followers a little thought for the weekend. My hope is that the message you need to hear finds you when you need it most. What a great idea! Love your beautiful cards! Thanks, Pat! I love them, too! They are such fun to create. Love them! I am drawn to how bright and playful looking they are with the message. To me, that brightness conveys the message of not sweating the small stuff. Thanks for sharing. Looks like fun! I might give this a go, myself. Yours are beautiful! Thanks so much, Melody! Go for it! I think just the act of making the cards can inspire. These are gorgeous! What a great idea! So colourful, joyful – with wonderful messages. Thanks, Bev. I can’t wait to see what the rest will look like! Each one is always a surprise in the end. Oh my goodness, what a project! Lovely colorful work! Thanks, Cindy. I am loving it! Just think, at the end of the year I’ll have 52 pieces of tiny art! A great idea, i love your cards. Makes me want to do it too! Thanks so much, Andrea! I say go for it! They are worth the effort! Hi Consie What a great idea. Now you’ve inspired me to try something new. I have a set of card and they would be perfect for this kind of project. Your cards are awesome. You’ve got me thinking. Happy PPF! Thanks so much, Gloria! Good luck with your version! Thanks, Janet! I appreciate the kinds words. Love your cards. I’ve made a couple of sets myself to give as gifts and you’re right …the message is usually one I needed that day. Thanks for sharing and CONGRATS on being the featured artist this week. Thanks, Carol! It was totally fun to be chosen! I loved seeing your colourful Insight cards when I checked in at PPF today, Consie! I have a round deck of cards that would be delightful to do a similar deck with. I like the idea of pulling out the strips at random, & working with that phrase! 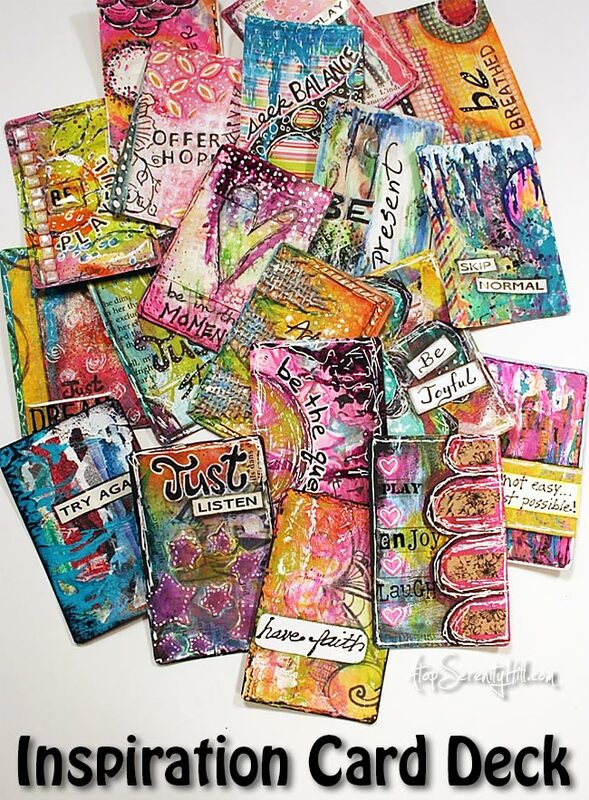 Thanks for sharing your cards, & congrats on being the PPF featured artist! Thanks, Nadya! I love the idea of round cards! They would work great with doodled mandalas. I’ll have to keep an eye open for a set like that. Love the messages! I so wanna do this now! Love these!! So beautiful and inspiring. I have several decks I am/ have been working on. Did you know that jumbo sized ones work really well, too? The children’s game section carries them in The Dollar Store. Thanks, Jo! I’ll have to look for the jumbo set as well. Someone else mentioned a round set which I thought would be fun to do with mandalas! These are beautiful and so encouraging. Congratulations on being featured at Paint party Friday. Thanks, Hali! And thanks for hosting the link-up. It is always nice to find some new inspiring art! My husband and I are moving to your neck of the woods next spring so perhaps we will have a chance to meet in person. Happy holidays to you and your family. WOW! Your cards are gorgeous! Beautiful cards and I love the random messages. I have started making some cards, at first as a way to comfort a friend. I’m having a lot of fun making them and think I will use your idea of random messages. One question: how do you keep your edges so clean? I glue papers onto mine front and back and always end up with uneven edges. Thanks, Barbara! So it took so long to answer your question! I usually just use a pair of scissors to cut off any excess paper. However, a lot of time, I am just using gesso and paint so there are no edges to clean up. I haven’t done anything with the back of the cards yet…cannot decide what to do! Hope that helps out.